Moto Code: Scrambler winter checklist....! So the time has come. My beautiful Katie has a few miles on the clock and now needs some freshening up. 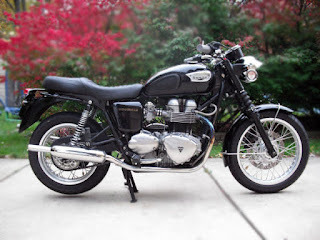 I have already started the process by ordering another set of superbars (chrome) from NewBonneville. These are what I have grown accustomed to over the last 5 years, the stock bars not working for me and my makeshift solution too cruiser-like. Rear shocks; Mine aren't exactly worn, however I have noticed a decline in sharpness. Also, some patches of rust have formed on the chrome....Not acceptable! My poor old seat cover is fading away and starting to lose a bit of shape. I intend to keep going into my golden years and frankly comfort can be an issue on long rides. I like the look of this one and the reviews are good. The one I have now has some scratches and is plastic. It looks the part, however I have longed for a polished item since the day I brought her home! Total costs: $1114.00. Needless to say that will have to be spread out over several months. Other jobs? Bleed the brakes and fill with new fluid, oil change and spark plug check. I will also do some detailing and finally get that damned dent pulled out of the tank! I have started and made some progress but it takes a lot of work.